“Trade of the Day” for Friday, 10/4 October 4, 2013 By Tom Bowley, Invested Central Brocade Communications Systems, Inc. (BRCD) is a $3.57 billion technology company that engages in the supply of Internet protocol based Ethernet networking solutions and storage area networking (SAN) solutions to businesses and organizations worldwide. BRCD is one of our ten “Diamond Stocks”. These Diamond Stocks have produced recent quarterly results that exceeded Wall Street consensus estimates and, based on our experience, these stocks generally outperform the broader market. 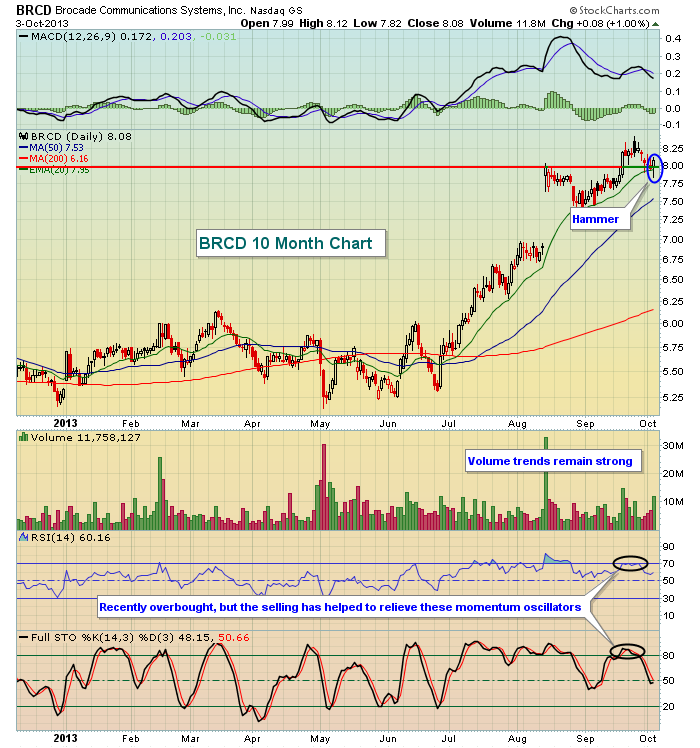 BRCD recently soared to $8.43, but became overbought based on extended readings on both its RSI and stochastics. In other words, it needed some relief and the recent selling provided that. Thursday’s action was quite bullish as BRCD fell well beneath its rising 20 day EMA intraday, then rallied in the afternoon, printing a hammer while holding 20 day EMA support. Tom’s Take: We like entry at the current price and again at $7.95 with a closing stop beneath $7.90. Our target is $8.43 initially, but we wouldn’t be surprised to see BRCD hit the $8.65-$8.75 area near-term.